Few things are as versatile as a cardigan, and this one will get you through winter in style. Luxurious yarn shows off the deceptively simple cable design and makes the finished sweater a joy to wear. The cable pattern is my adaptation of the Framed Cable from Barbara G. Walker's "A Second Treasury of Knitting Patterns". Bristow was my Maternal Grandmother's maiden name and she passed away at the age of 96 while I was knitting this sweater. 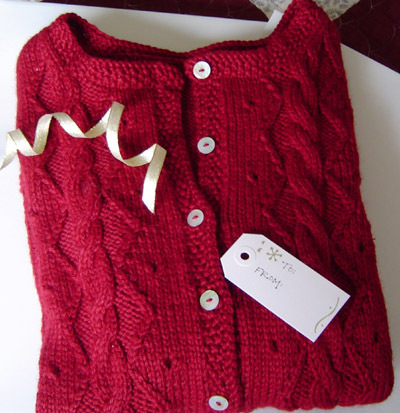 She was a redhead and while she didn't knit, it just seemed right to name a red sweater after her. This sweater can be worn as shown, or can be easily layered as the sleeves are designed with plenty of ease. 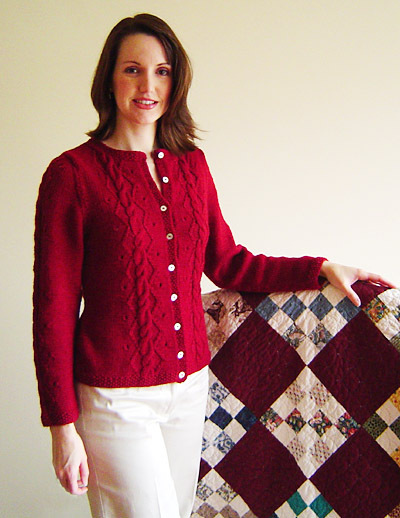 *It is a good idea to wait until after the sweater fronts are finished before buying buttons. 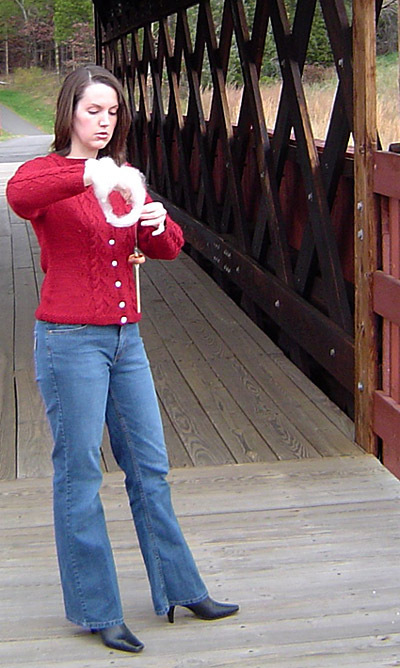 I placed a buttonhole at the top and bottom of the cardigan, as well as every place the traveling "framing" stitches pointed outwards towards the buttonhole band. 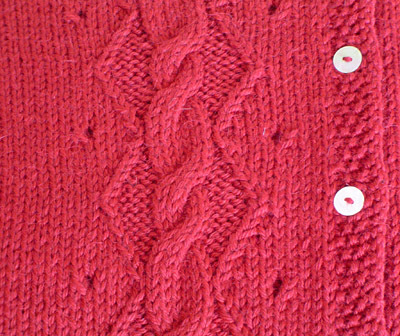 The button requirements are based on the number of cable pattern repeats you will work if your row gauge is correct, but you may wish to place your buttons differently, or to alter the length. If you wait until you've knit the fronts, you will be able to determine exactly how many buttons you'll need for your sweater. 19 stitches / 29 rows = 4 inches in stockinette stitch on larger needles. Repeat these 2 rows for Seed Stitch. Using smaller needles, CO 86[96, 106, 114, 124] sts. 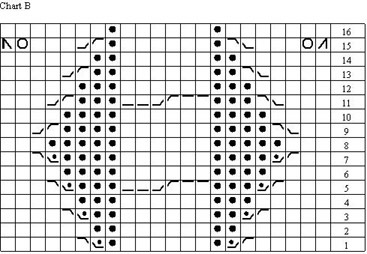 Work 7 rows in Seed Stitch, ending with a RS row. Using larger needles, work in stockinette st until work measures 3.25[3.5, 3.5, 4, 4] inches, ending with a WS row. Next Row [RS]: K2, ssk, k to last 4sts, k2tog, k2. Repeat these 4 rows 4 times more. 76[86, 96, 104, 114] stitches rem. Work 12 more rows in stockinette st: work measures approx. 7.75[8, 8, 8.5, 8.5] inches. Next Row [RS]: K2, m1, k to last 2 sts, m1, k2. Repeat these 6 rows 4 times more. 86[96, 106, 114, 124] sts. Cont in stockinette st until work measures 13[13.5, 14, 15, 16] inches, ending with a WS row. BO 6[7, 7, 8, 9] sts at beg of next two rows. BO 2 sts at beg of next 2 rows. 70[78, 88, 94, 102] sts rem. Repeat these 2 rows 4[4, 5, 5, 6] times more. 60[68, 76, 82, 88] sts rem. Cont in stockinette st until work measures 20.5[22, 23, 24.5, 26] inches (armhole measures 7.5[8.5, 9, 9.5, 10] inches), ending with a WS row. Next Row [RS]: K 18[22, 24, 25, 27], place sts just worked on st holder, BO 24[24, 28, 32, 34] sts, k to end. Next Row [RS]: K1, ssk, k to end. Repeat these 2 rows twice more. 15[19, 21, 22, 24] sts rem. Next Row [WS]: BO 5[7, 7, 8, 8] sts, p to end. BO 5[6, 7, 7, 8] sts, p to end. BO rem 5[6, 7, 7, 8] sts. Replace held sts on needle with RS facing, rejoin yarn. Next Row [RS]: K to last 3 sts, k2tog, k1. Next Row [RS]: BO 5[7, 7, 8, 8] sts, k to end. Using smaller needles, CO 48[54, 58, 62, 68] sts. Work 7 rows of Seed Stitch, ending with a RS row. Set-Up Row [WS]: Using larger needles, p4, place marker, p7, k1, p6, k1, p7, place marker, p22[28, 32, 36, 42]. Next Row [RS]: K to marker, work Row 1 of Chart A, k to end. Cont in patt as set, working Chart A between markers and working rem sts in stockinette st, until work measures 3.25[3.5, 3.5, 4, 4] inches, ending with a WS row. Next Row [RS]: K2, ssk, work in patt to end. Repeat these 4 rows 4 times more. 43[49, 53, 57, 63] sts rem. Work 12 more rows in patt: work measures approx. 7.75[8, 8, 8.5, 8.5] inches. Next Row [RS]: K2, m1, work in patt to end. Work 5 rows in patt. Repeat these 6 rows 4 times more. 48[54, 58, 62, 68] sts. Cont in patt until work measures 13[13.5, 14, 15, 16] inches, ending with a WS row. Next Row [RS]: BO 6[7, 7, 8, 9] sts, work in patt to end. Next Row [RS]: BO 2 sts, work in patt to end. 40[45, 49, 52, 57] sts rem. Repeat these 2 rows 4[4, 5, 5, 6] times more. 35[40, 43, 46, 50] sts rem. Cont in patt until work measures 19[21, 21.5, 23, 24.5] inches (armhole measures 6.5[7.5, 7.5, 8, 8.5] inches), ending with a RS row. Note: Read ahead. Neckline shaping and shoulder shaping are worked at the same time. Next Row [WS]: BO 8[9, 8, 10, 12] sts, work in patt to end. Next Row [WS]: BO 4 sts, work in patt to end. 23[27, 31, 32, 34] sts rem. Next Row [RS]: Work in patt to last 3 sts, k2tog, k1. Repeat these 2 rows 7[7, 9, 9, 9] times more. 15[19, 21, 22 24] sts rem. Next Row [RS]: BO 5[7, 7, 8, 8] sts, work in patt to end. Next Row [RS]: BO 5[6, 7, 7, 8] sts, work in patt to end. 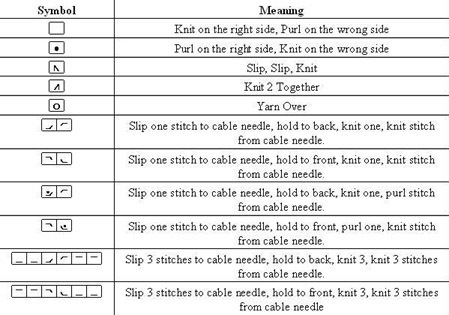 Set-Up Row [WS]: Using larger needles, p22[28, 32, 36, 42], place marker, p7, k1, p6, k1, p7, place marker, p4. Next Row [RS]: K to marker, work Row 1 of Chart B, k to end. Cont in patt as set, working Chart B between markers and working rem sts in stockinette st, until work measures 3.25[3.5, 3.5, 4, 4] inches, ending with a WS row. Next Row [RS]: Work in patt to last 4 sts, k2tog, k1. Next Row [RS]: Work in patt to last 2 sts, m1, k2. Cont in patt until work measures 13[13.5, 14, 15, 16] inches, ending with a RS row. Next Row [WS]: BO 6[7, 7, 8, 9] sts, work in patt to end. Next Row [WS]: BO 2 sts, work in patt to end. 40[45, 49, 52, 57] sts rem. Cont in patt until work measures 19[21, 21.5, 23, 24.5] inches (armhole measures 6.5[7.5, 7.5, 8, 8.5] inches), ending with a WS row. Next Row [RS]: BO 8[9, 8, 10, 12] sts, work in patt to end. Next Row [RS]: BO 4 sts, work in patt to end. 23[27, 31, 32, 34] sts rem. Next Row [RS]: K1, ssk, work in patt to end. Next Row [WS]: BO 5[7, 7, 8, 8] sts, work in patt to end. Next Row [WS]: BO 5[6, 7, 7, 8] sts, work in patt to end. Using smaller needles, CO 46[52, 52, 58, 60] sts. Set-Up Row [WS]: Using larger needles, p12[15, 15, 18, 19], place marker, p7, k1, p6, k1, p7, place marker, p12[15, 15, 18, 19]. Work 5 rows in patt as set, working Chart A between markers and working rem sts in stockinette st.
Repeat these 6 rows 16[17, 19, 19, 20] times more. 80[88, 92, 98, 102] sts. Cont in patt until work measures 16.5[17.25, 18, 18.75, 19.25] inches, ending with a WS row. BO 6 [7, 7, 8, 9] sts at beg of next two rows. BO 2 sts at beg of next 2 rows. 64[70, 74, 78, 80] sts rem. Next Row [RS]: K2, ssk, work in patt to last 4 sts, k2tog, k2. Repeat these 2 rows 12[15, 14, 16, 19] times more. 38[38, 42, 42, 40] sts rem. Next Row [RS]: K1, ssk, work in patt to last 3 sts, k2tog, k1. Next Row [WS]: P1, p2tog, work in patt to last 3 sts, p2tog tbl, p1. Repeat these 2 rows 1[0, 1, 1, _] time more. 30[34, 34, 34, _] sts rem. BO 4 sts at beg of next 2 rows. BO rem 18[22, 24, 24, 28] sts. Work Right Sleeve in the same way, working Chart B instead of Chart A.
Sew back to fronts at shoulders. Sew sleeves into armholes, lining up sleeve seams to side seams, and shoulder seams to center of cable patterns. Using smaller needles, with RS facing and beg at top corner of left front edge, pick up and k 3 sts for every 4 rows along left front edge. Be sure to pick up a st in top and bottom rows. Work 5 rows in Seed Stitch, ending with a WS row. Decide on desired number and locations of buttonholes. (Top buttonhole will be worked as part of the neckband, so do not place a buttonhole too close to the top edge.) It is a good idea to place one buttonhole for each repeat of the cable pattern, opposite the point where the pattern points outwards. One additional button is written into the directions, near the bottom edge. Mark desired locations of buttonholes with safety pins, near front edge. Using smaller needles, with RS facing and beg at lower corner of right front edge, pick up and k 3 sts for every 4 rows along right front edge. Be sure to pick up a st in top and bottom rows. Work 1 row in Seed Stitch. Next Row [RS]: Work 2 sts in Seed Stitch, w2tog, yo, [work in Seed Stitch to desired location of buttonhole, yo, w2tog] until all buttonholes have been worked, work in Seed Stitch to end. Work 3 more rows in Seed Stitch, ending with a WS row. BO all sts purlwise. Using smaller needle, with RS facing and beg at right front edge of neckline, pick up and k 1 st for each bound off st and 3 sts for every 4 rows around neckline. Next Row [RS]: Work 3 sts in Seed Stitch, w2tog, yo, work in Seed Stitch to end. Sew buttons to button band, opposite buttonholes. Melanie Gibbons knits and spins in Northern Virginia with her husband, son, and a cat who likes to eat alpaca fiber. Read all about it and see more of her designs at her blog: Pink Lemon Twist.